Foodie April ~ Journal of a dreamer. April has been a relatively good month for me. Although I have nothing much to say regarding my work (what's new right), but I'm glad that my own efforts have finally borne fruit and that my plans may be executed sooner than the deadline I have given myself. After I came back from Aussie, this was my first lunch with Grumpy. I love anything with eggs, so once I knew that Yin Ji had opened up a stall in Singapore (and it was near le workplace), we decided on this place for lunch. If le dad's plan to bring us back to our ancestral village in China materialises, I'd definitely drop by Yin Ji in Guangzhou as well. Salted chicken noodles for Grumpy. Pork and century egg for the Cantonese me. The porridge was quite good as the texture was really smooth. I found the portion just nice for one person though. At $6, it still doesn't come close to beating my all-time favourite, which is still porridge from Zhen Zhen in Maxwell Food Centre. 'Twas Friday the 13th, and lunch kaki decided to scare herself by buying some very expensive lunch. OK, the lunch wasn't as expensive as I thought in the end lah, but still more expensive that what we'd usually eat for lunches on weekdays though. We've been waiting to try DOCO, which was located at International Plaza, since last year, but not sure why it took us so long to come here. I'm sure we had other distractions along the way hahaha. I decided to get the beef don set, which comprised of a rice bowl and either a coconut shake or coconut soft-serve. I got myself the coconut shake for $12.90. My beef bowl was exceptionally delicious! So damn juicy and good! My other colleagues ordered the chicken, which was good as well, but beef was really da bomb. The crispy fish skin and onsen egg made everything even more flavourful that it already was. Such a good buy! I'd definitely return to this place, but don't think I'd be getting the set anymore, because I thought that the coconut shake was really meh. It didn't taste refreshing at all (tasted like those cheap packaged coconut water which you could easily buy from any supermarket for cheap) and I was really disappointed that the cup was so small as well. Like... if I had to pay $3 for such mediocre-tasting coconut water, I might as well forego it altogether and pay only for the rice don, which I felt was more worth my money. The queue was really very long by the time we reached the restaurant. However, the diner must first order at the counter first before being shown to their seats. So although the restaurant offered free seatings, you won't be able to chope your seats first before you can order. As there were only two of us, we were gestured to make our orders at the counter after waiting in the queue for around 15 minutes. 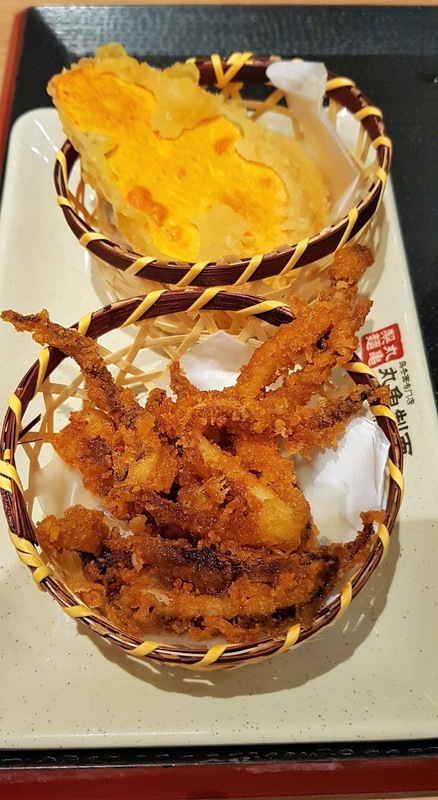 I got the sweet potato tempura, as well as the squid tentacles, which I really highly recommend! Even Grumpy said that this was damn shiok! I love eggs a lot, so it was no wonder that I decided to go for this dry udon, which came with seasoned cod roe and half-boiled egg. This was really super yummy, as when mixed, the burst of flavours from the mentaiko and half-boiled egg were really distinct. I felt that it went super well with the udon, which were handmade in the stall, and therefore, tasted super chewy and clean. Grumpy got himself the plain udon, but added on a plate of beef as ala carte and a few other tempura items. 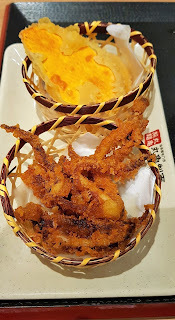 The tempura items were really good too, as we could tell that they were just freshly out from the fryer. Believe it or not, this was really my first time ordering mala, all by myself. While I have eaten mala before, le mum used to do all the ordering. ._. I decided on having mala from Ri Ri Hong, because one, they charge you by ingredients and not by weight, which I liked, and two, I was already familiar with this place, having come here a number of times. Both of us managed to knock off relatively earlier this day, so we decided to go further for dinner. We decided on Putien in the end because I've been wanting to dine there for a really long time (since early last year), but had no chance to do so until today. We went there without any reservation, but thankfully, were shown to our seats 5 minutes later. As this was both our first time at Putien, we were at a loss as to what to order, so we searched up some food blogs for inspirations. Guess who we saw? In fact, I think nobody else noticed that The Muttons were there HAHAHA. Grumpy was the first one who spotted them. The lor mee was highly recommended on some food blogs, but I felt that while this was special, this wouldn't be my to-go dish if I return to Putien again. I prefer the normal lor mee, with lots of garlic and vinegar. Grumpy said that the shredded pork bun looked really good, and the minimum order for this was 2, so we got 2 lor. We got the waitress to wrap the above dish into a visually-appealing bun for us. I must say that this was really good as well. The buns were very crispy and well-toasted, which added a crunch to our wonderfully-marinated pork. I found this a bit expensive though, at $4.50 per bun, but it definitely warranted another must-eat from me. Grumpy's sweet potato and pumpkin dessert, which was damn good! The sweet potato and pumpkin could be distinctly tasted, it wasn't sweet at all and tasted super natural. I love my yam, so I had the orh nee. The orh nee here was very healthy-tasting and not heavy on the palate at all, unlike the typical Teochew version, where you could taste the lard and coconut cream. Grumpy did not really fancy this as he felt that it didn't have much flavour. For me, I really liked this, as it meant that I wouldn't get jelat even after eating multiples of this, which I didn't get to do LOL. Both of us liked the chilli sauce so much that we decided to get our mums the chilli sauce as well. It retails for $6.80 per bottle, and it does come in a pretty packaging. Great for gifts I'd say! This post sums up my foodie journey for April. Here's to having more nice-tasting food, even when both of us are trying to cut down on what we're eating. ._.